We use decimals as our basic number system. The decimal system is based on the number 10. It is sometimes called a base-10 number system. There are other systems that use different base numbers, like binary numbers which use base-2. One of the first things to learn about decimals is the place value. 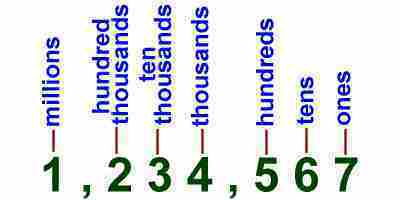 The place value is the position of a digit in a number. It determines the value that the number holds. Comparing the numbers 700, 70, and 7; the digit "7" has a different value depending on its place within the number. The place value of the 7 determines the value it holds for the number. As the place moves to the left, the value of the number becomes greater by 10 times. Another important idea for decimals and place value is the decimal point. The decimal point is a dot between digits in a number. Numbers to the left of the decimal point are greater than 1. Numbers to the right of the decimal point hold values smaller than 1. The right of the decimal point is like a fraction. In the case where the place value is to the right of the decimal point, the place tells you the fraction. For example, 0.7 is in the tenths place and represents the fraction 7/10. In the number 0.07 the 7 is in the hundredths place and is the same as the fraction 7/100. 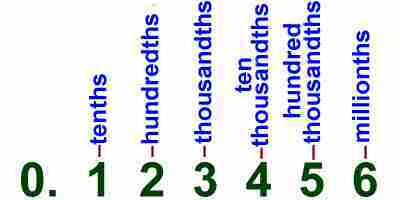 In the decimal system each place represents a power of 10. Here is a chart showing how this works. For example, when we say 7 is in the hundreds place in the number 700, this is the same as 7x102. You can see from the chart that when the place value is to the right of the decimal point, then the power of 10 becomes negative. When you start to do arithmetic with decimals, it will be important to line up the numbers properly. When lining up decimal numbers, be sure to line them up using the decimal point. This way you will have the other place values lined up as well. Line up the numbers 2,430 and 12.07. The two numbers are lined up by place value and you can begin math like adding or subtracting.